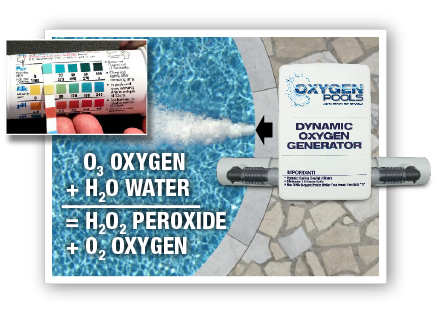 First, the Oxygen Pools Dynamic Oxygen Generator automatically oxidizes contaminants in the water as it feeds ozone into the pool water. Simultaneously, our patented high-velocity generating system creates a safe residual level of hydrogen peroxide in the water. This is accomplished automatically whenever the generator is running and is measured using test strips. Shocking your pool weekly plays an important part in maintaining healthy water. Pools can be shocked with chlorine or non chlorine shock. As a weekly treatment, our Blended Weekly Additive simplifies your water treatment program by replacing the need to add multiple chemicals every week. This weekly additive contains activated oxygen blended with other natural compounds that shock the water and keep it fresh and clear. Because the Formula contains no chlorine, you can swim in minutes after dosing! You’ll see the difference immediately in water quality and clarity. There’s nothing that looks and feels like an Oxygen Pool! The Dynamic Oxygen Generator installs onto any type of filter without special tools. Using the existing pool pump, water is circulated through the generator which automatically adds dynamic oxygen to the water as it circulates back to the pool. No other equipment changes are needed.